Sustainable Partnerships occur when you develop interpersonal relationships to inspire committment. The Facilitating Partnerships Workshop is a highly interactive and engaging program combining proven theory and best practices in the areas of facilitation competencies, knowledge of group dynamics, and techniques for running effective partnership meetings. The workshop includes concepts, tools and insights that are critical to success for any facilitator. DR. EILEEN DOWSE is an Organizational Psychologist and author (“The Naked Manager”). She specializes in global leadership and cross-cultural communications. She is founder and chair of the International Institue of Facilitation (INIFAC) which certifies Master Facilitators (CMF’s). Eileen is welcomed as a warm & engaging executive coach & dynamic course facilitator. 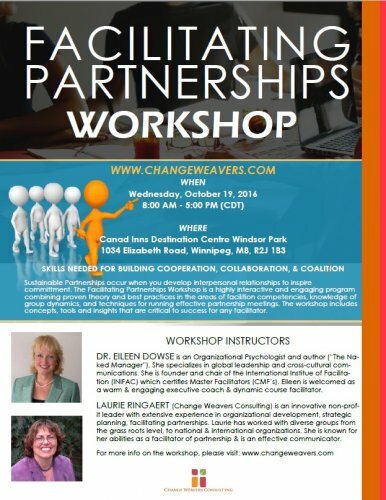 LAURIE RINGAERT (Change Weavers Consulting) is an innovative non-profit leader with extensive experience in organizational development, strategic planning, facilitating partnerships. Laurie has worked with diverse groups from the grass roots level, to national & international organizations. She is known for her abilities as a facilitator of partnership & is an effective communicator.